Basil with family after accepting his Honorary Doctorate. Dr Basil Hetzel AC often refers to chance and good fortune as factors in his success. He even believes a bout of pulmonary tuberculosis following his graduation was a mixed blessing. While it ended his career in the air force, it saw him take a pioneering path in medicine that would go on to affect up to one billion people around the world. It was Basil who first recognised the effects of iodine deficiency in contributing to high rates of brain damage called cretinism. He established the International Council for the Control of Iodine Deficiency Disorders (ICCIDD) to increase awareness of the seriousness of iodine deficiency and to work on programs to eradicate this widespread but easily remedied condition. 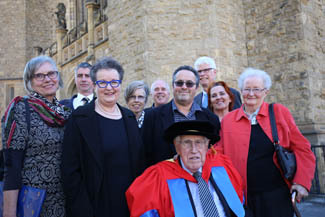 Basil’s work has seen him honoured around the world and this year the University of Adelaide paid him the highest academic recognition in awarding him an honorary degree of Doctor of the University for his distinguished service to medical research in South Australia and, more broadly, to society. At the ceremony, Vice-Chancellor and President Professor Warren Bebbington said that Basil’s outstanding achievements in major aspects of public health and clinical medicine have had a substantial impact on the lives of many individuals. “He has served the University of Adelaide, his State and his profession with distinction, and received the Distinguished Alumni Award of the University of Adelaide in 1995,” he said. Basil graduated from the University with a Bachelor of Medicine in 1944 and went on to win a Fulbright Scholarship, spending three years in New York with his family followed by a year in London at St Thomas’ Hospital. It was after his return to Adelaide, while working as the University’s Michell Professor of Medicine at the Queen Elizabeth Hospital, that he began his most influential studies of iodine deficiency in Papua New Guinea. He proved the effectiveness of iodized oil in treating goitre and it was incorporated into the international public health practices of the World Health Organisation and UNICEF. Basil continued his work in Melbourne, as the first Chair of Social and Preventative Medicine at Monash University, and by 1970 his team demonstrated that correction of iodine deficiency before pregnancy totally prevented endemic cretinism and related conditions. This was pacemaking, global research. From 1986, as the CSIRO’s first Chief of the Division of Human Nutrition, he showed that iodine deficiency caused retardation of brain development in sheep and in marmoset monkeys. Iodine Deficiency Disorder (IDD) is now recognised by WHO as the most common preventable cause of brain damage in the world with more than 2 billion people at risk in 130 countries. “A global program of prevention of IDD and other childhood disorders was launched at the UN World Summit for Children in New York in 1990 which provided unprecedented political support at Heads of State level,” said Basil. “By 2000, household usage of iodized salt had increased from less than 20 per cent before 1990 to 60 per cent in 2000, with further progress since.